Nikon’s Monarch 3 Series offers a versatile range of riflescopes designed for the modern hunter. There are magnification options in the Monarch Series of riflescopes start at 1-4x and go all the way to 6-24x. 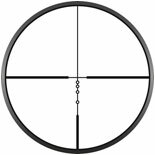 The Monarch 3 series has 4 reticle options BDC, Nikoplex, MidDot, and German #4, with select scope models featuring reticles in the first focal plane. All Monarch 3 riflescopes feature Nikon’s ClearCoat® Optical System that allows for up to 95% light transmission, making a Monarch 3’s sight picture bright, clear, and high contrast.